I wrote this newsletter before heading to Phoenix for the College Football national championship. I have worked with Clemson the last four years and it's special to see a team you have watched compete, struggle, learn, and grow, have the opportunity to play for a championship. But to me, sports is about more than wins and losses. It's about relationships and impact. Regardless of what team you root for, as you read this I hope you will think of ways to build your own connected team. Whether it’s Dabo’s supersized belief in his team, his courage to call a fake punt pass (that led to a first down) to a 300lb defensive lineman creating a huge momentum shift in the college playoff, great coaching by the offensive and defensive coordinators, a special and gifted QB, timely defensive stops and fortuitous plays in key games during the season, or a group of players with the rare combination of size, speed and talent, Clemson has been a force of belief, will and skill. But for all the talk about Dabo's fun personality and down to earth coaching style, Deshaun Watson’s duel threat ability, Wayne "Train" Gallman’s running and Shaq Lawson’s habit of wreaking havoc on opposing offenses, there’s one big reason for Clemson football’s success that hasn’t been mentioned and I believe it could be one of the biggest of them all: Dabo’s Safe Seat. While sitting in Dabo’s office in early August he told me about a chair his friend found and brought him from a remote fishing village. He said it was one of those fishing villages where guys sit around in a circle on these stools and talk about life, family, fishing, etc. It gave Dabo an idea and he called it the Safe Seat. He placed the stool in the team meeting room and after each practice a different teammate sat on the Safe Seat while the team gathered around him in a circle. Dabo then asked the teammate questions about his life, his heroes, his defining moment, and his challenges. When Dabo was finished asking questions, the rest of the team were free to ask questions as well. It was called the Safe Seat because it was a safe place for each person to share his story and heart with his team. It was a safe place to be vulnerable knowing that whatever was shared while sitting on the stool would not leave the room. It was a safe seat in a safe room. As each teammate took their turn in the Safe Seat, the players began to know each other a whole lot better. The walls of ego, pride and selfishness came crumbling down as vulnerability and authenticity paved the way for meaningful relationships, trust, and strong bonds that helped create a connected team. In You Win in the Locker Room First, a book I wrote with former Atlanta Falcons Coach Mike Smith, we share the 7 C’s to build a winning team. Connection is one of the most important C’s because we have found that a connected team becomes a committed team. A connected team will commit to each other, fight for each other and serve each other. When the pressure mounts, adversity strikes and the game is on the line, connected teams rise up together and, more often than not, find ways to win close games. I've played on and worked with enough teams to witness the power of a connected team and Clemson is one of the most connected teams I have ever seen. While visiting with the Clemson team a few weeks before the New Year’s Eve college playoff game, I asked Dabo if he thought the Safe Seat was one of the reasons they had become such a tight knit team. He said, "Without a doubt. The bonds we created during training camp are a big part of the success we are now experiencing." It may be more exciting to talk about X’s and O’s and Heisman trophy candidates than it is about a stool from a fishing village. After all, even the most connected teams won’t win championships if they don’t have great coaching and talent. But with Clemson, Dabo and his Safe Seat brought all the belief, all the talent, all the individual goals and all the potential together to build a connected, joyful, and committed team. This 3 minutes represents the best impact of sports. Watch this. It will touch your heart. 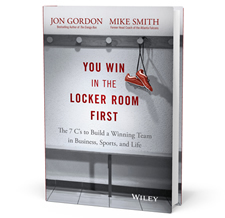 Discover the 7 C's to Build a Winning Team in Business, Sports, and Life with "You Win in the Locker Room First" by Former NFL Coach, Mike Smith & Bestselling Author, Jon Gordon. Get the accompanient action plan here.